We had originally planned to visit Nikko for a day trip outside of Tokyo to view the fall colors. I had been following Japan-Guide’s Autumn Leaves Report in the weeks preluding our trip and it seemed as though most of the trees in Nikko were past peak. I had also read that many of Nikko’s temples were under construction. When I was planning our vacation I had a hard time deciding between Nikko and Kamakura for a day trip outside of the city. At the last minute, we decided to join Rie’s “Explore Kamakura” group tour instead of making the 2.5 hour journey alone to Nikko. 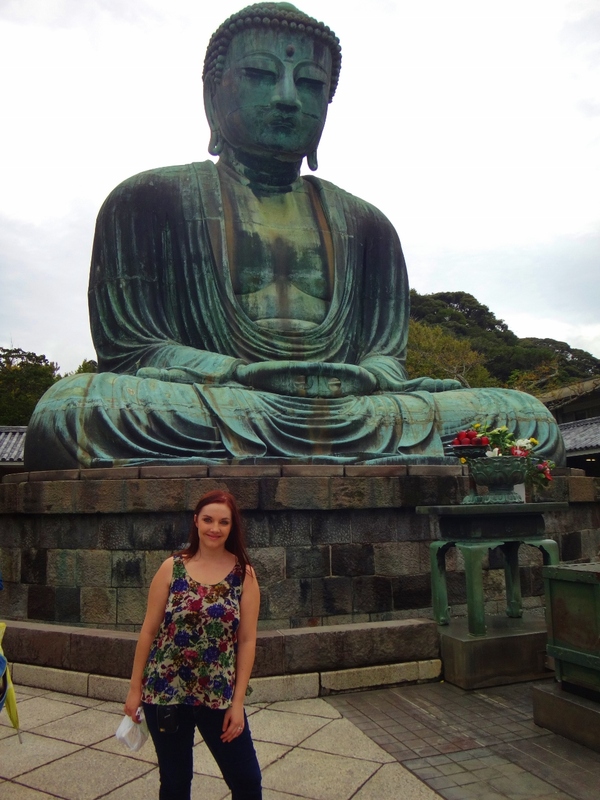 We had loved our experience with Rie (Backstreet Guides) during our previous two days in Tokyo, so we thought why not have her show us around Kamakura as well! We met up with our group at the Kita-Kamakura Station at 10am. There were 6 of us on the tour plus Rie, and another guide she was training. 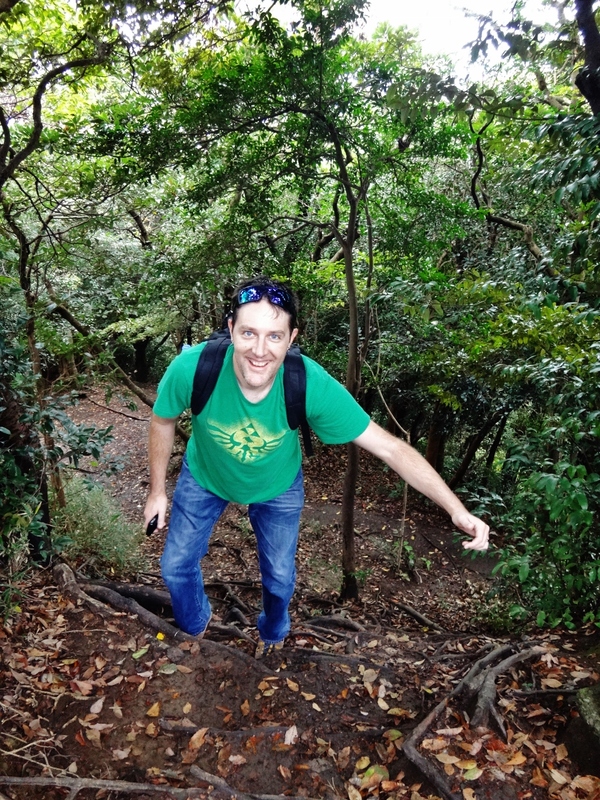 We started our day by hiking through some mountainous trails that we were told were ancient samurai trails. 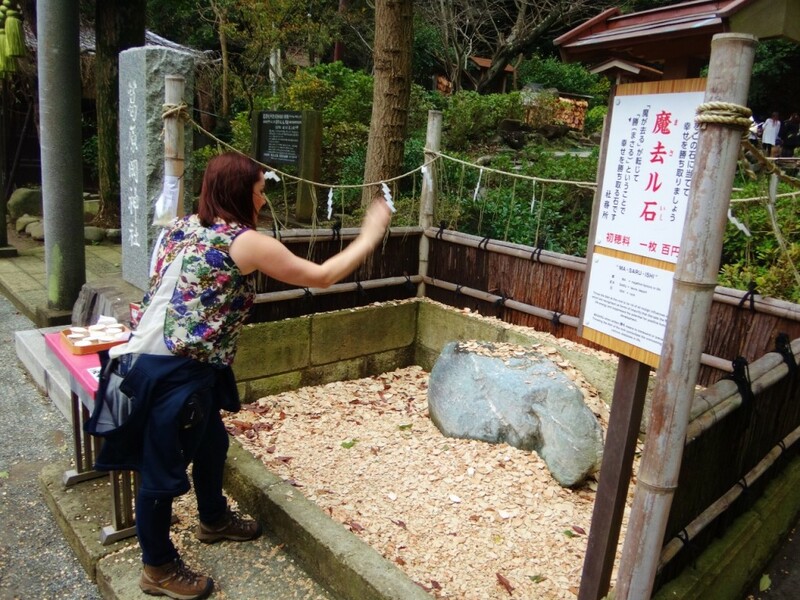 We arrived at our first shrine for the day, KuzuHaraOka, a love shrine ornamented with two large rocks at the entrance. Rie explained to us that the short, wide rock on the left represented the wife and the tall, skinny rock on the right represented the husband. The two rocks were tied together with a red rope symbolizing the husband and wife being bound together for eternity. 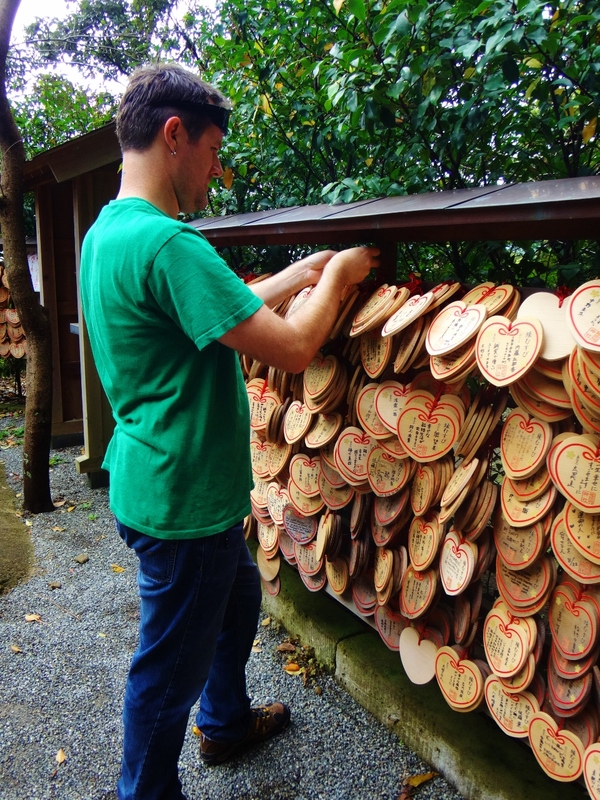 Brian and I took some photos here and wrote a wish on an “Ema” (a wooden wishing plaque) that we hung near the shrine. 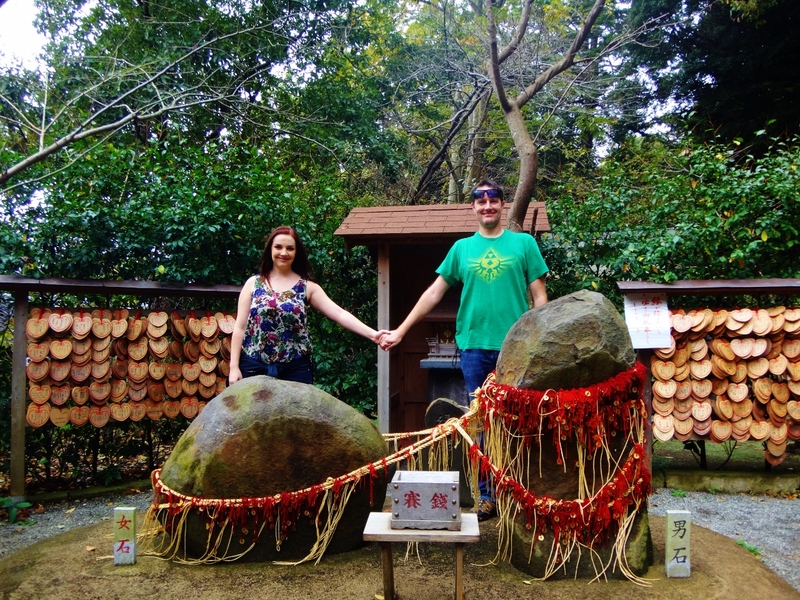 TRAVEL REVIEW: Kuzuharaoka Love Shrine Must do for Couples! As our group was leaving the love shrine, we noticed 2 older men dashing around with a plastic bag and picking up something off the ground. 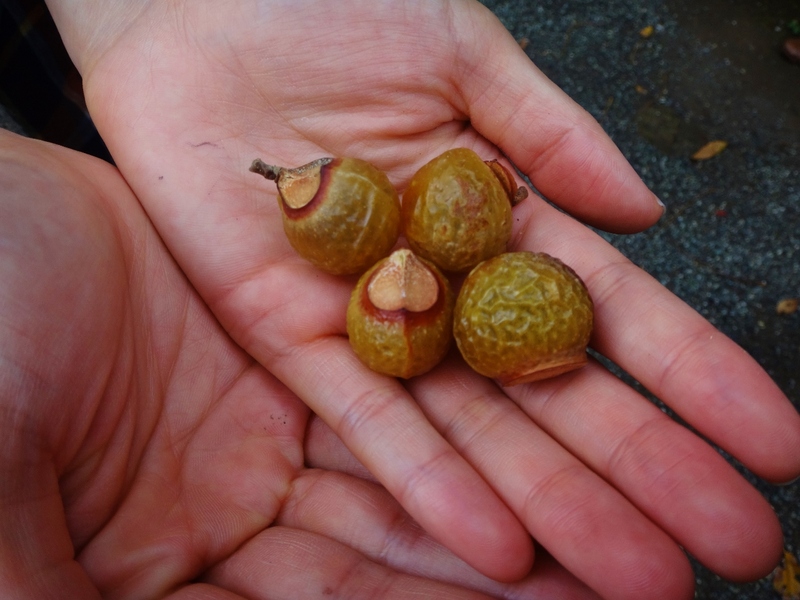 Our guide, Rie, called out to the men in Japanese and excitedly joined them in picking up these small round pods. Our whole group joined in and we all started collecting the pods from the ground – not knowing what they were. When it seemed like we had collected them all, Rie explained to us that these were the seed pods from a very rare tree in Japan, a Mukuroji Tree. About the size of a grape, and dark yellowish in the color, the outer shell of the pod had a rigid plastic look to it. If you shook the pod you could hear the little seed/bean rattling around inside. Rie told us that the outer shell can be used as soap and once it dissolves, you keep the inner bean as good luck. We each took one to bring home. Right around the corner from the love shrine, I noticed a large stone surrounded by a million tiny pieces of broken clay. 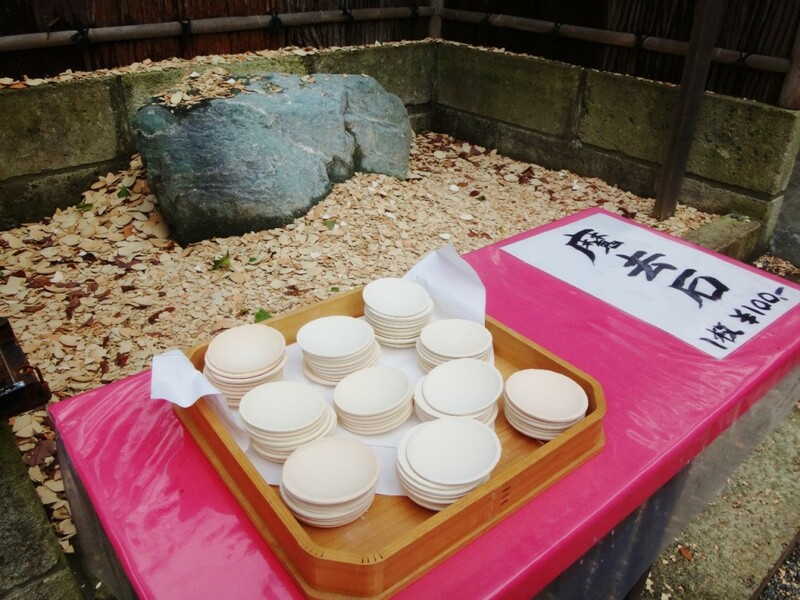 There was a table of small clay bowls sitting next to the stone. I asked Rie about this and she told me that if you throw a clay bowl and break it against the stone that it is supposed to break your bad luck. This was exactly what I needed after being told I had very bad luck at the Sensoji Temple just a couple of days before. I donated a few coins, grabbed a clay bowl and threw it against the stone as hard as I could! 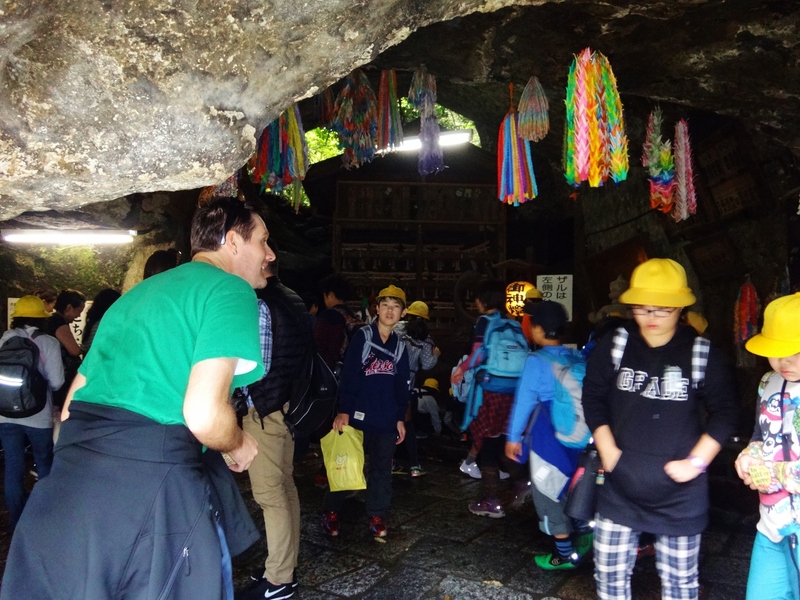 After some more hiking, we arrived at the Zeniarai Benten Shrine which we entered through a short underground tunnel. The shrine grounds were very atmospheric and I really enjoyed wandering around the complex. 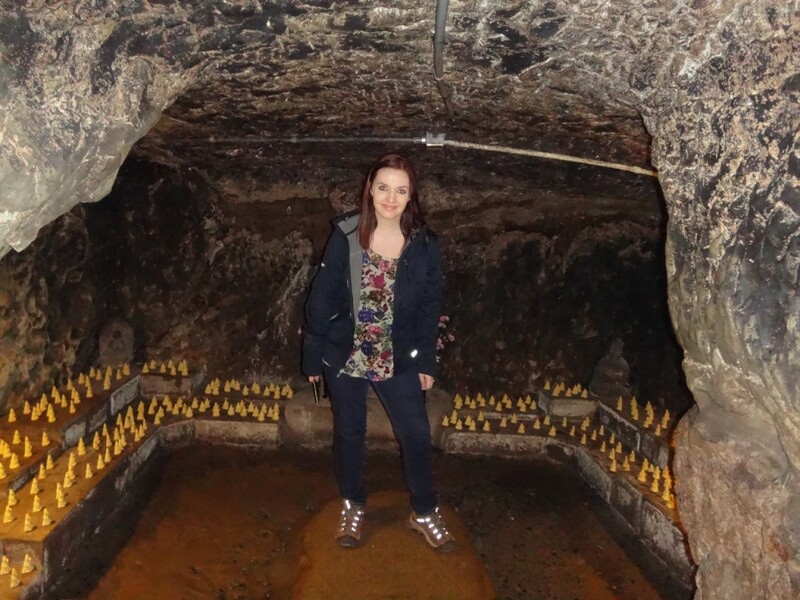 After lighting a few candles and burning some incents, we ducked into a cave-like area where we saw people washing their money in the spring water. 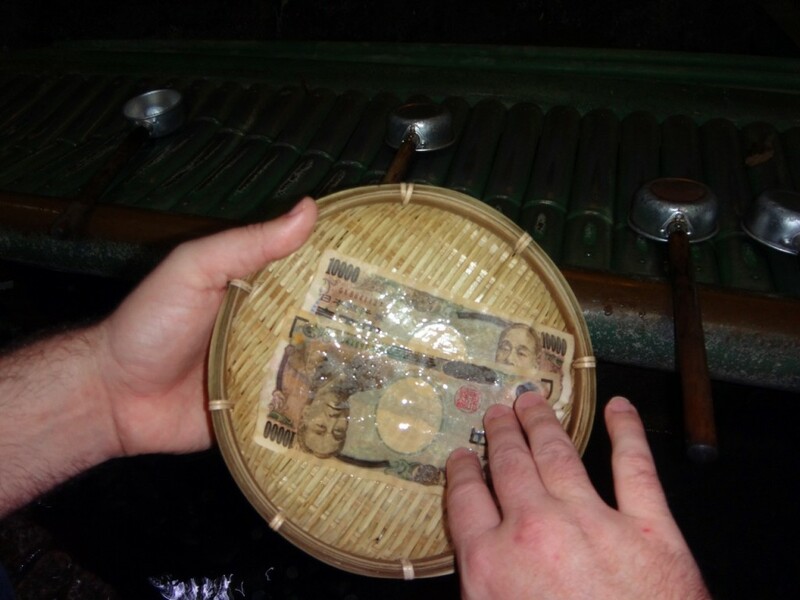 Money washed in the water here is said to double after you spend it. 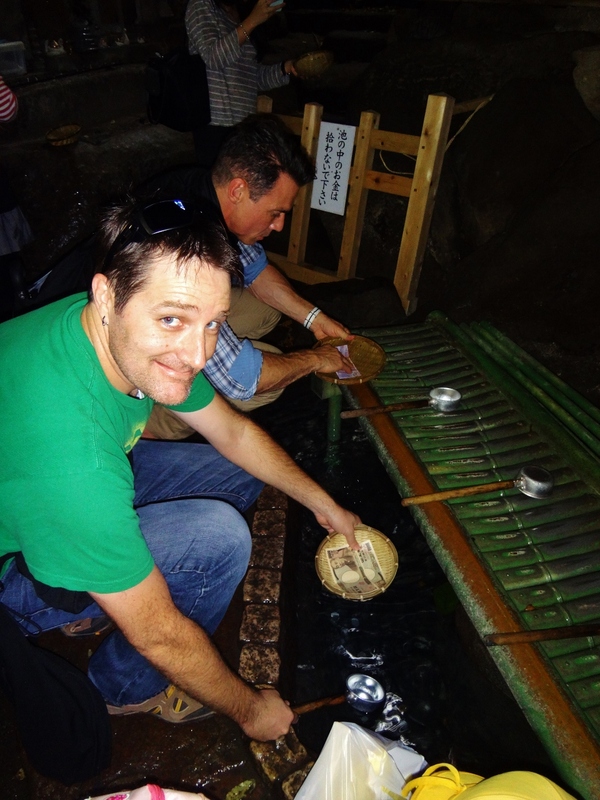 Brian and I grabbed a basket and a 10000 yen bill and started washing! It was a very fun experience and everyone was all smiles and giggles washing their money. 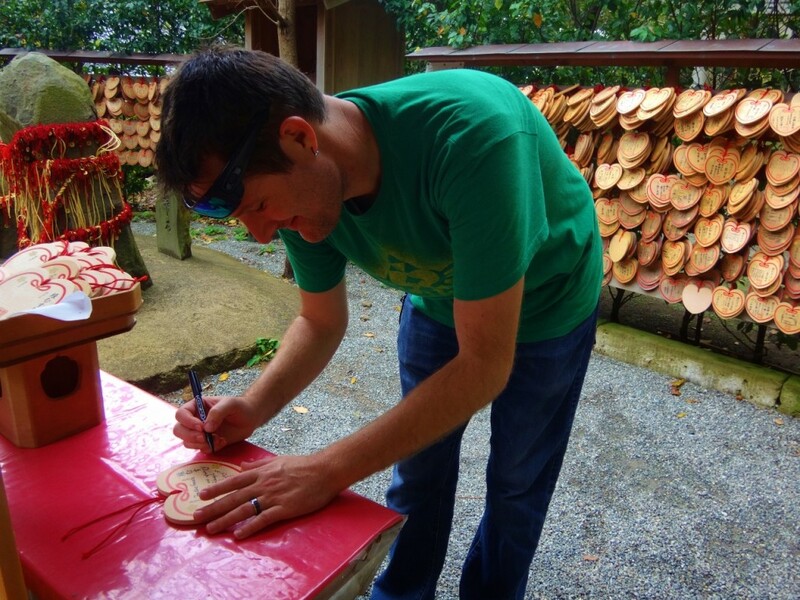 TRAVEL REVIEW: Zeniarai Benten Shrine Trip Highlight! Once we washed our money we walked around the complex for a few minutes and found a lovely little Koy pond with a beautiful orange bridge. We walked through town admiring the beautiful homes of Kamakura and before we knew it, we had arrived at the Great Buddha of Kamakura. The giant bronze statue was much different than all of the shrines and temples we had visited in the past few days – we were awe struck by its magnificence. 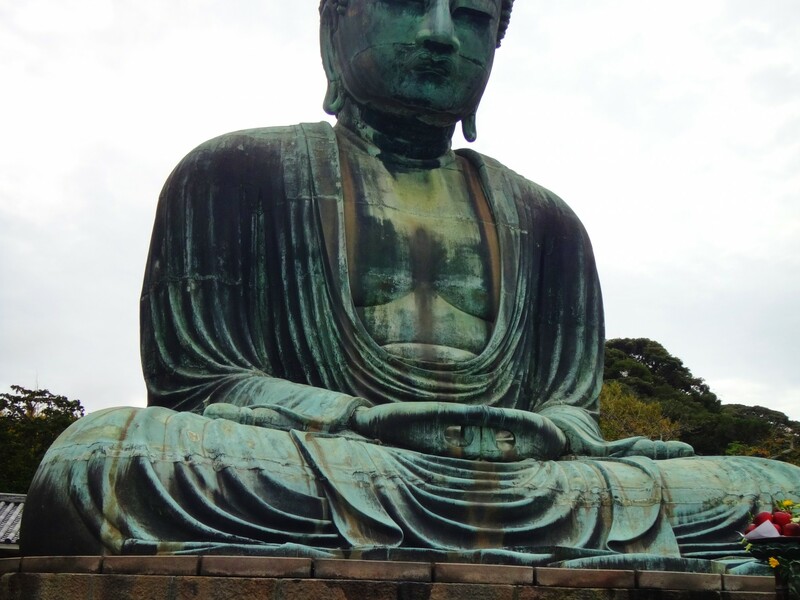 TRAVEL REVIEW: Great Budha of Kamakura Trip Highlight! The area was very crowded but as with most of Japan, it still seemed very peaceful. I picked up a few mini Buddha souvenir statues before we left for lunch. 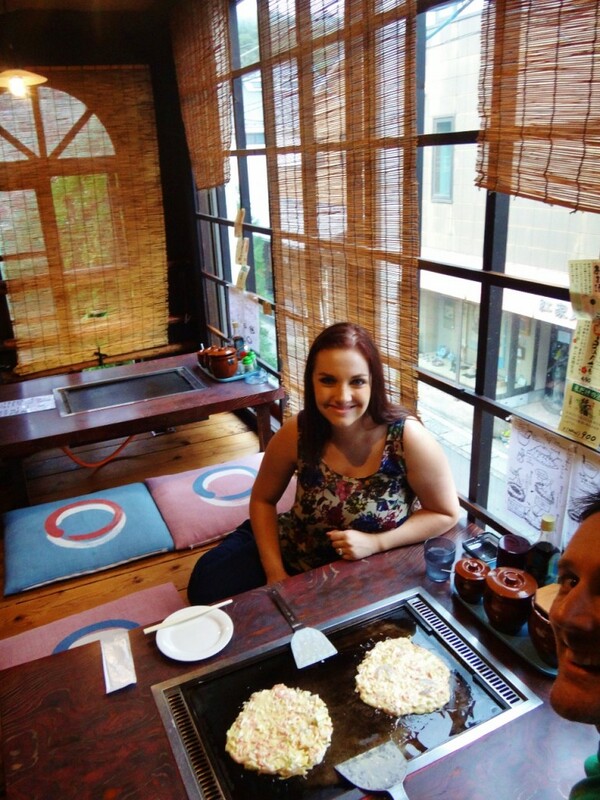 Our guides took us to an Okonomiyaki restaurant for lunch where we had the option of traditional style seating (on a pillow with a low table) or western style seating. 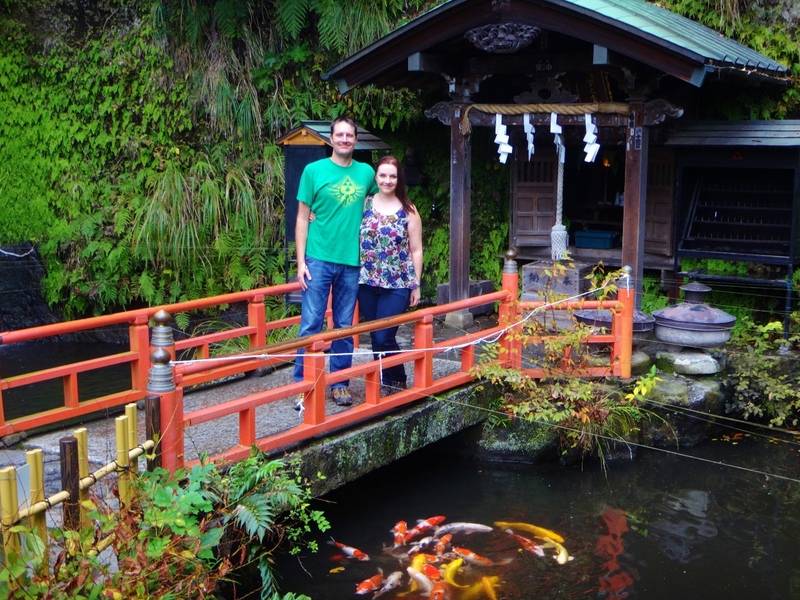 I was surprised that Brian and I were the only ones who chose the traditional style seating, but it was our first experience with traditional Japanese seating and we wanted to have the experience. Our server brought everyone out a bowl of ingredients which consisted of shredded cabbage, some kind of batter, a raw egg, ground beef, and pieces of chicken, clams, and shrimp. We were instructed to mix the ingredients together with the spoon and pour them onto the griddle which had been heating up. 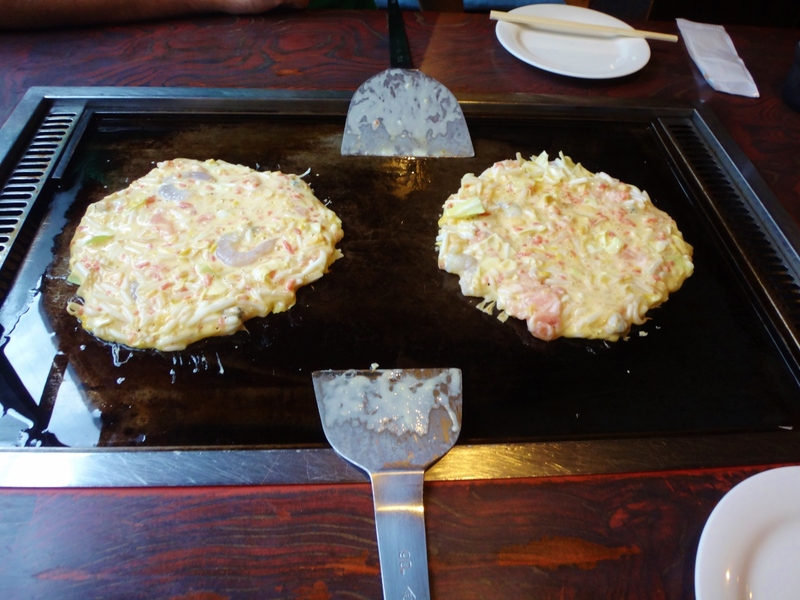 The best that I can describe Okonomiyaki is a “savory pancake/omelet.” The server showed us how to flip the “pancake” over and add toppings like soy sauce and seasoning. After about 10 minutes of cooking, we used the spatula to cut it like a pizza into about 6 separate pieces. This meal was delicious, and even though I am not a fan of clams, I ate every piece! 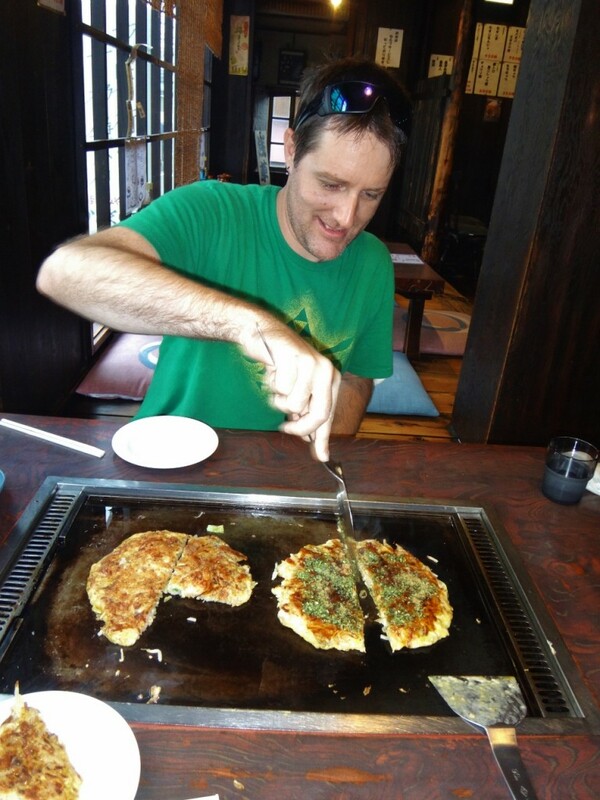 TRAVEL REVIEW: Okonomiyaki Trip Highlight! 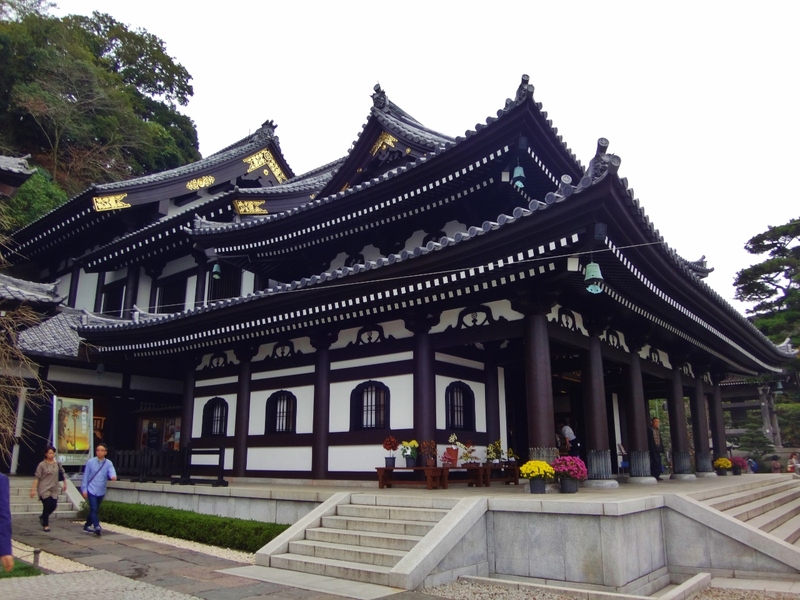 After a wonderful lunch we headed to the Hasedera Temple Complex which was quite large. We had about an hour to ourselves to explore the area. 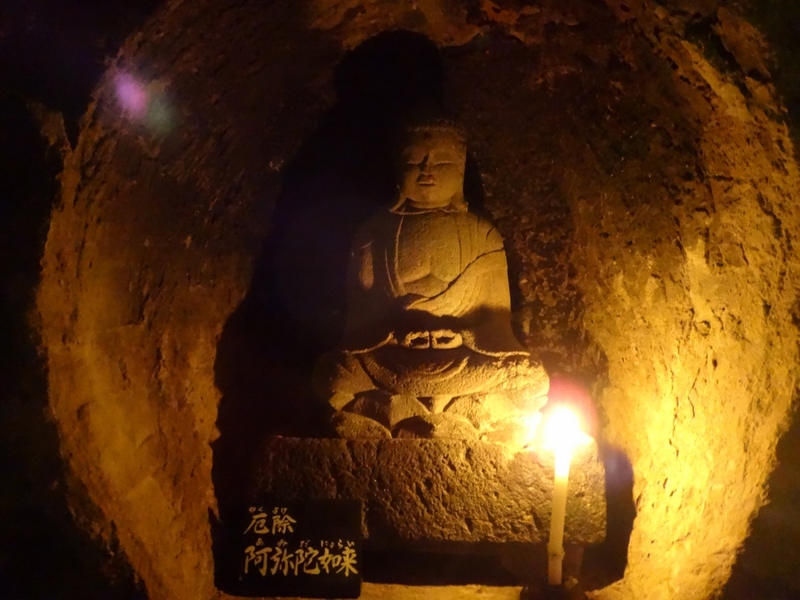 We first visited the benten kutsu cave which consisted of small maze-like tunnels featuring many candlelight sculptures. 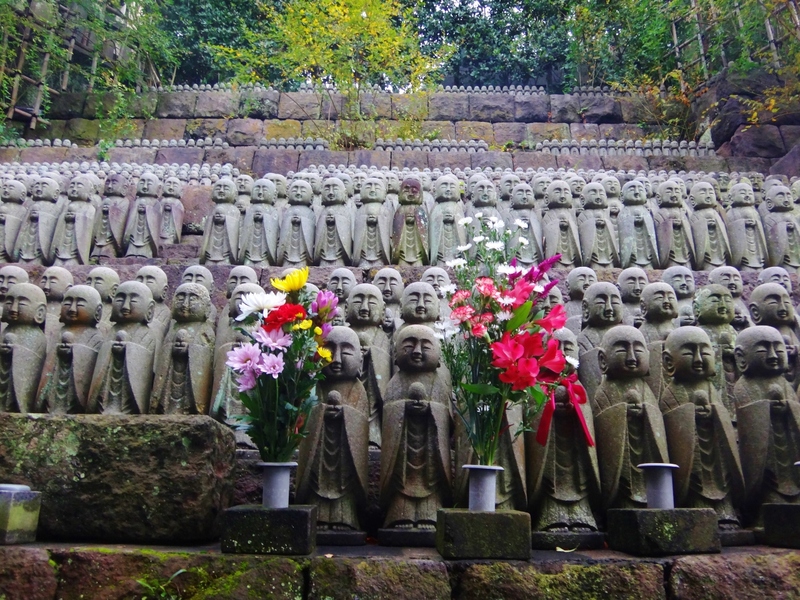 We then made our way up to the main temple, stopping at the Jizo-do Hall where there were hundreds of small statues. Arriving at the main temple, we first noticed the amazing view of the Kamakura coastline. We took some time to relax and take in the view before exploring the temple building. This temple was very beautiful and I liked the traditional white and brown colors. Time went by quickly in such a large temple complex, and before we knew it our hour was up and we had to go meet up with our group. 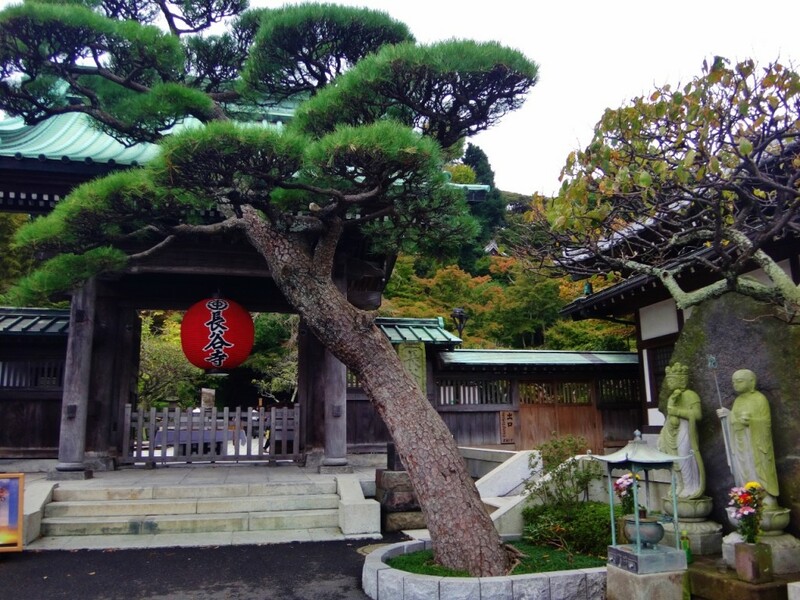 TRAVEL REVIEW: Hasedera Temple Must Do! We took a small local train to Kamakura central where we had time to browse the local craft and food stores along Komachi dori. We ended up purchasing quite a few souvenirs here including some handmade soaps, tenugui hand towels, and a few tea cups. 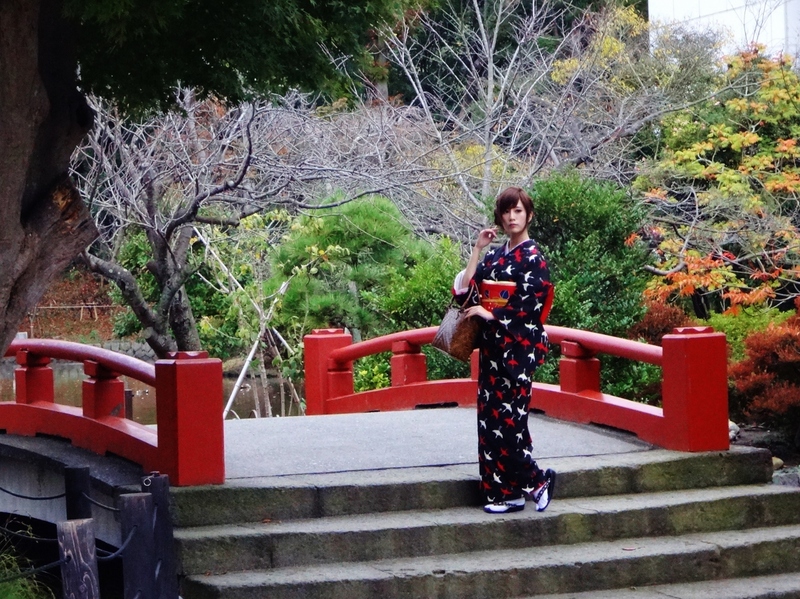 The tour ended at the Tsurugaoka Hachimangu Shrine where we saw many young girls dressed in traditional Kimonos taking pictures in front of the beautiful scenery. 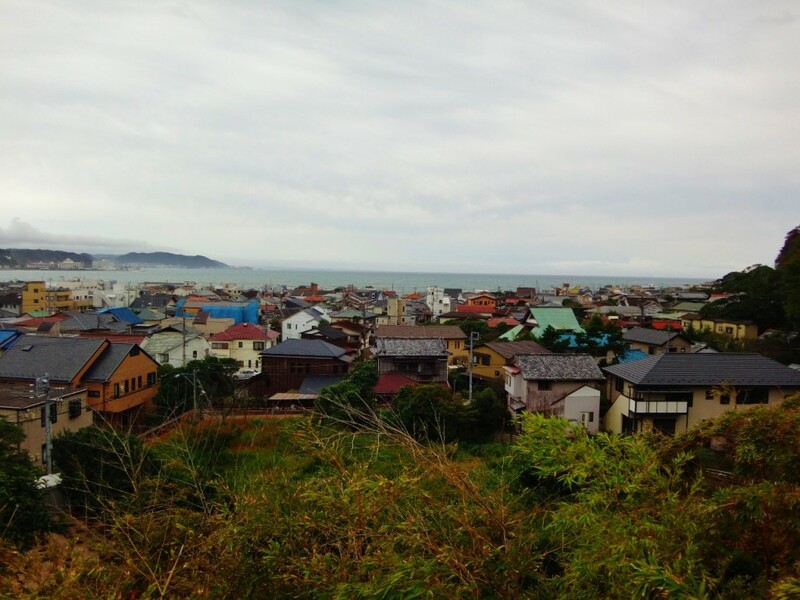 We spent some time walking around the area before heading back down the shopping streets towards the train station and back to Tokyo. 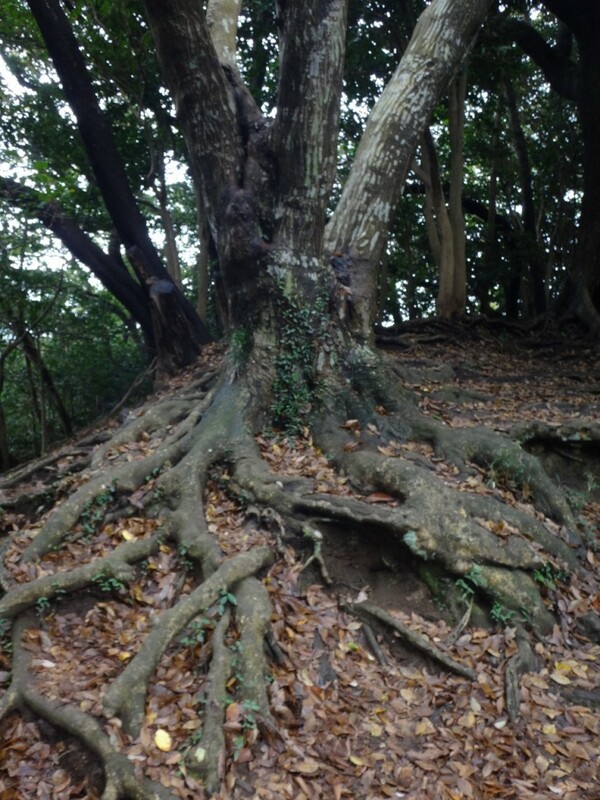 I was very happy with our decision to visit Kamakura instead of Nikko. Because Kamakura was closer (just an hour train ride from our hotel) I feel like we were able to get in a longer day of sightseeing. 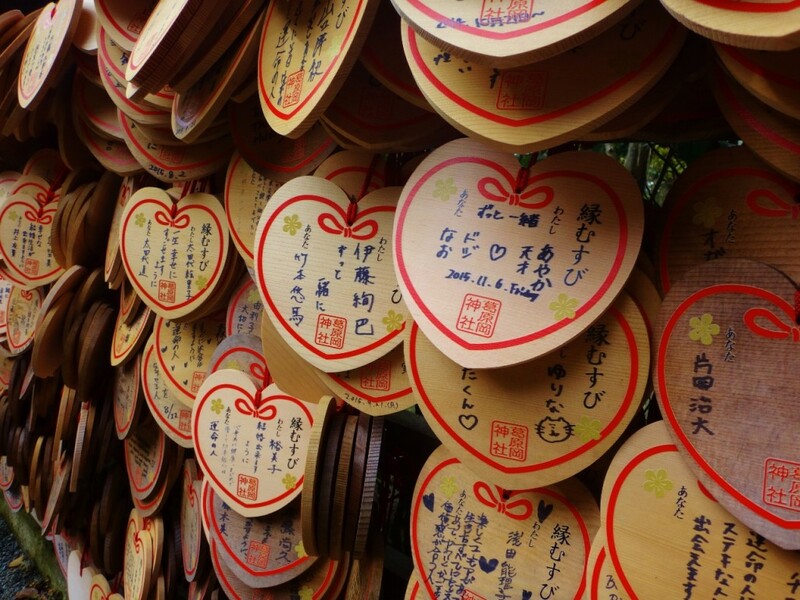 Our day in Kamakura ended up being one of my most favorite days in Japan with the hiking trails, the love shrine, the money washing shrine, the Great Buddha, our Okonomiyaki lunch, Hasedera Temple, and Komachi dori shopping streets all being highlights for me. I’m really glad we decided to join another walking tour as I don’t think we would have been able to see half as many places as we did in just one day. I think another reason I particularly enjoyed Kamakura is because we had a guide with us explaining the meanings and history behind each place we visited. There were so many times during the rest of the trip that we wished we had our guide, Rie, there with us to answer our questions. It was sad to say goodbye to Rie at the end of the day as we felt we had made a great friend. 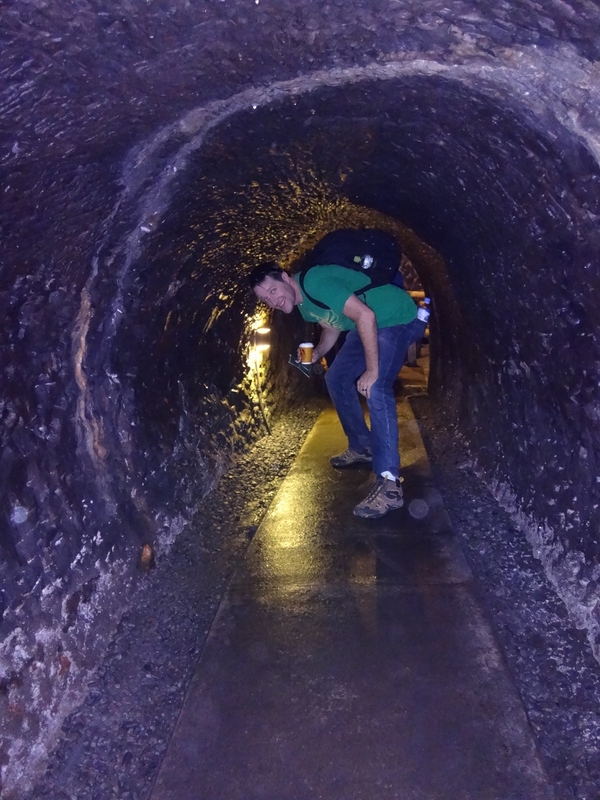 TRAVEL REVIEW: Backstreet Guides Explore KamakuraTour Trip Highlight!